This online parent child compatibility calculator takes into account the names of the parents children. The bonding between a mother, father and their child is based on the name compatibility between them. Prevention is better than cure is the cliché that most aptly applies in this situation. 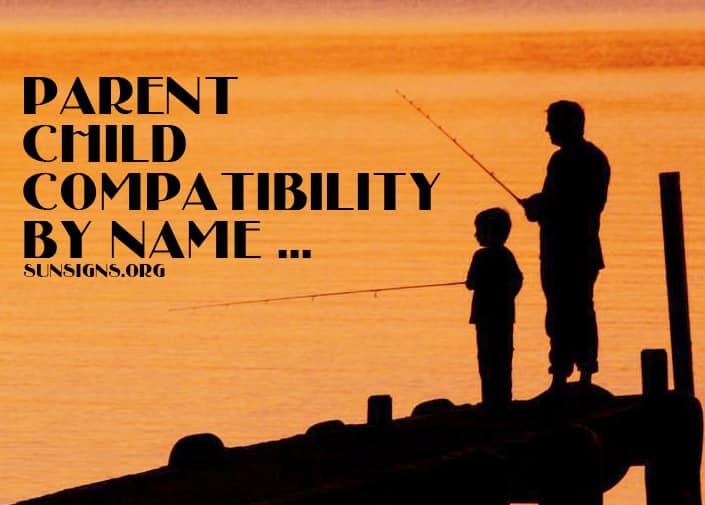 This is because it would be wise to take this compatibility test before your son or daughter is named and then name him or her accordingly rather than changing the name for a better compatibility after the child has already been named once. This is the 21st century and nuclear families have become a common sight. While there are certain advantages of a nuclear family, there are some pretty big disadvantages. Earlier there used to be many members in the family and then children had a bigger family to talk to and learn from. However nowadays, in the era of nuclear families there is a new dimension for the kids. Today within the immediate family the child is in only contact with the parents and the same goes for the parents. Thus the importance of parent child compatibility is automatically raised. With the help of principles of numerology, one can determine the level of compatibility by the parents’ and child’s name. These principles dictate careful choice of letters in a name. One must be cautious while selecting the letters of names for a child so that the letters that are chosen lead to those characteristic features and qualities that are desired. Doing so would in a way guarantee higher levels of compatibility between parents and their children. If the child has already been named then in that case, a compatibility check could be done. This can help you know how easy or difficult this relationship will be. There are many experts who advise parents on the suitable names that would lead to an amiable relationship between the parent and children. However most of these experts are difficult to approach and are also highly expensive. On top of that there is no guarantee of their love analysis. One cannot take a risk in these matters because if the suggestion turns out to wrong then the parent would get to know about it at a very later time and the results would be disastrous and irreversible. This is where the free and easy to use parent child compatibility calculator by name presented over here becomes useful. All one needs to do is enter the full name of child, the father’s name and the mother’s name and then select the button with free parent child name compatibility written on it. If the details are entered correctly then a detailed analysis report comes up containing the destiny number of the child, mother and father. The parent child compatibility report also contains the individual attributes of the child, father and the mother and quality of relationship between them. Suggestions are also given to improve your relationship. Thus everyone should definitely try using this tool and improve the parent child relationship. Take steps to improve it because children are the most important part of anybody’s life. Next Why I Love Reading?